...losslessly edit MP3s, AAC, Apple Lossless and AIFF files. No re-encoding or switching formats means perfect audio quality for your files! ...Break a long recording up, by using split to create multiple files. ...remove unwanted audio, like commercials, from audio you want to keep. ...fade audio in and out to create a pleasing listening experience. ...create MP3 and AAC ringtones for your cell phone. Ajor Enhancement: Fission now fully supports tabs on MacOS 10.12 (Sierra). Previous versions could crash when attempting to make new tabs, so be sure to update! Major Enhancement: We've made optimizations throughout the app to make this the snappiest Fission yet. Waveform generation is now 20% faster, and AAC saving has been sped up as well. Enhancement: Chapterized AAC and MP3 files now use the Album tag as the Title for the file. Enhancement: Fission will automatically set a default title based on any file's name, and set Artwork from a video file's preview frame. Enhancement: Save operations can now be cancelled if necessary. Bug Fix: AIFF/WAV limits are now checked before transcoding, so that malformed (overly long/large) AIFF and WAV files won't be created. Bug Fix: Compatibility with rare and poorly-formed AAC files has been improved. Bug Fix: Several small cosmetic improvements have been made, including fixes to the “Where” field, file name display in the Inspector, and the Comment field. Bug Fix: The “.m4b” and “.aif” extensions are now allowed by the Save panel. MP3 Chapters: Fission now supports saving chapter marks in MP3 files, as well as editing existing chapterized MP3s. MP3 chapters are handy for podcasters in particular. Faster MP3 Encoding: MP3 encoding has been sped up, and is now 3x faster. Damage Visualization: When Fission loads a damaged file, it will now visually display bad packets in the waveform. The display of bitrates for AIFF and WAV files has been improved. This update fixes a bug where partial M4A files, created when a recording issue occurred in Audio Hijack, failed to load. An issue where certain lesser-used types of AAC files would not load properly has been corrected. An audible glitch that could occasionally be heard at the end of playback of some audio files has been corrected. A rare bug where Fission might crash with certain types of AIFF or WAV files has been fixed. The software update mechanism (powered by Sparkle) now runs securely over HTTPS. Other minor fixes and improvements have been made. This version improves file support for several different file types. First up, loading of AAC and Apple Lossless is much faster. In addition, support for Apple Lossless files has been improved, with support for the rare 20-bit ALAC format. Tag support for FLAC files has also been improved. Rounding out our improved file support, chapterized AAC files are now better supported as well. Fission is now fully certified for use with Mac OS X 10.11 (El Capitan). Fission now requires Mac OS X 10.9 (Mavericks) or higher. If you're still on 10.8 (or lower), be sure to see our Legacy page. Fission now offers full support for developer preview versions of Mac OS X 10.9 (Mavericks). Fission is now a 64-bit application. That is literally twice as many bits as before. You probably won't notice much difference just yet, but this will enable performance gains in the future. The QuickTime engine for opening file has been replaced with our own internal libav. Some extremely rare file formats may no longer be supported. Get in touch if you a format you use is missing. Fission has an entirely new saving pipeline. Hopefully, you won't even notice, it will simply work. Oh, saving a ringtone from the Mac App Store version of Fission works a bit better, that's potentially noticeable. Dragging a song from iTunes into the Mac App Store version of Fission should now work the first time. Previously, it only worked after two tries. Yes, really. The License window has been overhauled, with HTML. Neat! Chapters which contain multiple images now load images more logically (grabbing the first image in the chapter). The app now has a hidden "Check for News" option, accessible by pressing option while in the Fission menu. Fission's debugging window has been slimmed down. Fission's now better handles excessively large AAC and Apple Lossless files which violate their respective specifications. Many other small improvements have been made. They're not worth spelling out, but they're in there, and they're nice. The Batch Converter has been updated to properly handle all Windows Media files, as well as ALAC-encoded CAF files, and more. A crash where the App Store version of Fission could crash when inserting silence has been corrected. Fission now handles .m4a_partial files, to recover corrupted AAC files. Several additional VoiceOver improvements have been made, with labels on previously unlabeled controls. We're always working to improve this. The Channels selector now properly appears for mono files (if Stereo is selected, the mono channel is simply cloned). Clip tabs now always show the clip name. An issue where some FLAC files wouldn't properly open has been corrected. Fission's looping now properly updates when you change the selection. Fission's time wells now properly update when undoing. Fission Progress Indicator now properly remembers its position. Fission now retains the Inspector state between launches and file opens. The Batch Converter's Convert button now properly deactivates after a conversion finishes. Keyboard shortcuts now loop through Inspector tabs. Smart Split's "Insert Splits" button now properly accepts Return. Artwork wells now illuminate when an image is hovered over them. Removing or cropping a whole file no longer gives a dumb error. Fission now better illustrates when a file's audio is clipping. Thanks, Kirk! A drawing issue when moving the playhead backwards has been corrected. Improvements have been made to prevent already-rare deadlocks and crashes in PTWorkerThread. Fission now better handles UTF-8 in ID3 tags. Simply moving the playhead no longer dirties a file. Fission had a problem with overusing the CPU when all windows were closed. That problem has been eradicated. A problem some users saw with Exporting and Transcoding acting unresponsive, even as it worked, should now be gone. Fission is sorry if it seemed to be ignoring you while it worked. The Start Window now remembers its state between files and launches. If you close it, it'll stay pretty well closed, and not annoy you so much. But please, don't you forget about it. Fission now better remembers previously used settings for saving and exporting. Amnesia be gone! Progress bars should now appear more reliably when exporting audio. An issue where the Mac App Store version of Fission would fail to save to a previously-specified location is now fixed. Several small issues related to re-encoding of audio have been corrected, preventing unnecessary re-encoding. Fission is now better a reading in chapterized AAC files. It was already pretty great, to be sure, but now it's even better. Several VoiceOver improvements have been made, with labels on previously unlabeled controls. We've still got more work to do, so watch for further updates, VoiceOver users! A conflict with Many Tricks' window manager Moom, which caused the selection of split points to fail, has been handled. Assorted rare crashes should now be even more rare, so rare that you might suspect they're gone entirely, which they are! There are probably other improvements which we've forgotten. The best way to be sure you've got them is, of course, to update. Fission's Batch Converter now accepts folders (containing audio files), as well as individual files. The Save panel now correctly remembers the last location to which files were saved. An issue with chapterized AACs and very large image files has been corrected. Fission now has a hidden preference, accessible via the Debugging window, to check for and prevent rare Normalization clipping. Several other small bugs have been corrected. An issue where attempting to Save (with Cmd-S or by choosing Save) would cause an error for users of the Mac App Store version has been corrected. Fission is now fully Retina-ready! MP3 export now supports both constant bit rate (CBR) and variable bit rate (VBR). AAC export now supports High Efficiency encoding (HE-AAC). Files can now be dragged from iTunes into Fission's Start window. Fission can now import audio from .mov, .wma, .avi, .mp4 files, and more. A bug which could trigger an alert when closing an unsaved document has been fixed. Album artwork now properly appears in the file's icon when available. Fission now writes iTunes-style tags to AIFF files, non-standard though they may be! Using "i" and "o" to create a selection has been improved, allowing playback while creating the selection. Any file can now use the "Save As Chapterized AAC" option, regardless of its current file format or number of clips present. Fission's Save dialogs now properly handle file extensions. Files imported via QuickTime now only allow for an Export, to avoid overwriting the original file. In addition to the iTunes dragging noted above, the Start window now takes drags of all document types Fission can open. An issue where converting file formats erroneously produced CBR files (despite claiming to make VBR files) has been corrected. A problem where the Undo menu item unhelpfully said "Undo Button" for several actions has been fixed. The Start window no longer appears than immediately disappears on launch, when Fission is opening to a file. It also no longer immediately reappears when closed if no other windows are open. The delete and backspace keys now both perform the same expected functions. Issues caused by Fission overzealously writing its file icon, such as other applications not correctly changing the icon at a later point, have been removed. Erroneous errors which could pop up when cancelling transcoding, exporting, or saving have been fixed. When an error occurs during Batch Conversion, the Batch Converter continues with the rest of the files after the error dialog is dismissed. Closing the Start window no longer immediately re-opens it. "Remove & Split" has been renamed to "Remove and Split" in the Clip menu. Support for several additional sample rates (88.2, 96, 176.4, 192 and 352.8 kHz) has been added to ALAC, FLAC, AIFF, and WAV. Chapterized AAC files which must be converted now save to the 128 kbps 44.1 kHz stereo AAC format (instead of 192 kbps). "Save As Chapterized AAC" is always available now, regardless of original file format or number of clips present. Chapter images for Chapterized AAC files are now all padded to the size of the largest image. An issue where closing an unsaved document in trial mode could still result in a corrupting save has been fixed (2.0.0a2). "Export Selection" now features the keyboard shortcut Option-Command-E.
A new hidden preference for checking for Normalization Clipping has been added, accessible from the Debugging window. Custom format selections for exporting and batch converting have been improved to prevent invalid formats. Fission's accessibility for visually imparied users has been improved, correctly labeling several unlabeled elements. Fission now supports the TLEN ID3 tag. Fission now better handles malformed FLAC files, and supports more tag types in FLAC. Fission can now read AAC 3gpp files. Fission now correctly preserves creation dates when saving over old files. Fission's revamped interface makes it easier and more pleasant to use than ever. It's now possible to open multiple audio files at once, in multiple windows. Fission now has full editing support for FLAC and WAV files. MP3, AAC, Apple Lossless, FLAC, AIFF, and WAV are now all supported for editing in Fission. In addition to being saved losslessly in their original format, it's also possible to Export audio files to another format. MP3, AAC, Apple Lossless, FLAC, AIFF, and WAV are all supported for exporting. The new Batch Converter makes it possible to convert multiple files to another format with just a few clicks. SoundCloud support is now built right in to Fission, to make it a snap to share your files on the web. Fission can now quickly save Chapterized AAC files, for creating enhanced podcasts. Fission now uses our new manual system, with improved navigability. It is now also searchable. Fission's icon has been updated for full Retina compatibility, and throughout the site. The app itself will be updated for Retina in the future. We've also made too many other small improvements and fixes to list. An issue with the Revert command malfunctioning has been corrected. * CPU usage during playback has been reduced. * 24-bit mono files are now properly supported. * A long hang which could occur when closing large documents in certain circumstances has been fixed. * A crash caused by buggy QuickTime components failing to provide a file extension has been fixed. * A glitch occurring when fading to the end of a file has been corrected. * A bug caused by certain characters in the name of an iPhone ringtone has been fixed. * A bug where the waveform was not show correctly at certain zoom levels has been fixed. * A problem with fades placed at the very end of MP3 and AAC files, introduced in version 1.6.7, has been corrected. * Fission now requires Mac OS X 10.5 or later. * An extremely rare crash that could occur while pausing playback has been fixed. * A problem which would cause faded sections to not respect gain changes or normalizations in AIFF, WAV, and CAF files has been fixed. * A serious crashing bug that could occur when a fade was set has been fixed. * A Split at Playhead toolbar button is now included for easier splitting. * Files can now be dragged to Fission's Dock icon right from iTunes. 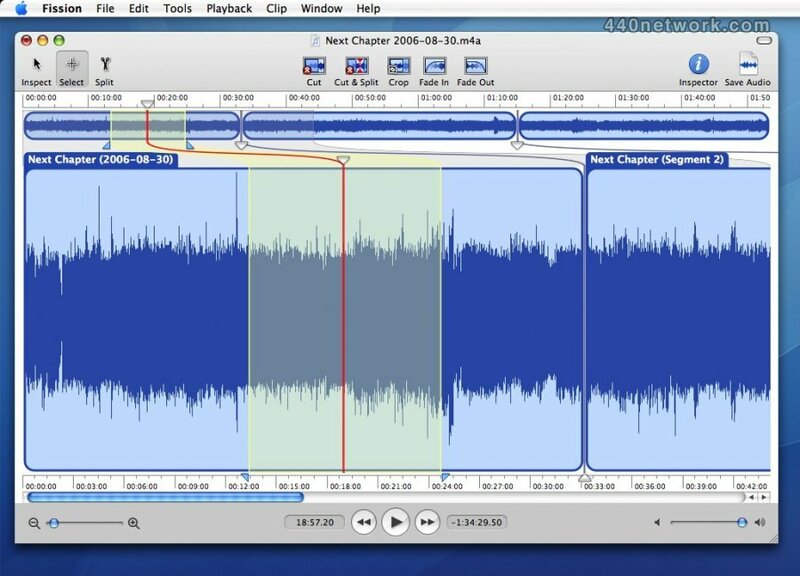 * Fades are smoother, as they're applied directly to the waveform data in Apple Lossless, AIFF, WAV, and CAF files. * Fission now has full compatibility with Mac OS X 10.6 (Snow Leopard). * A bug where Fission would run a redundant spotlight query for metadata, resulting in decreased performance at startup, has been fixed. * NUL bytes are now removed from filenames when saving, fixing a bug which would truncate filenames of files with badly-formed titles. * Improved window flushing should reduce or fully prevent flicker in certain circumstances. * If Fission is hidden at startup, the Welcome Window is no longer improperly shown. * A bug where QuickTime would refuse to export to certain filenames containing colons has been worked around. * A bug with saving partial Apple Lossless frames has been fixed. * A bug where Fission would not allow aborting the save of a very long AAC file has been removed. * Fission no longer offers to install Smart Crash Reports. * When decoding errors from corrupt files occur, silence is now produced instead of garbage data. * A bug where custom registration window errors would display incorrectly has been fixed. * Fission now checks for updates weekly, instead of every 15 days. * Software update check now sends the processor architecture to the server. * Looped playback is now properly gapless. * A bug with the new scrubbing indicator and waveform scrolling has been fixed. * Parsing of WAV files has been improved. * Runaway memory usage when using Smart Split or applying a cue sheet to very large files has been corrected. * CAF files can now be opened by dragging them to the Fission application icon. * The Shift-arrow key combination now behaves correctly in all cases. * A crash when opening a cue sheet and then canceling the open file sheet asking to locate the audio file has been fixed. * Registration information is now written to disk immediately when entered. * All preferences are now written to disk immediately after being changed. * The application name and version are now shown in the Registration window. * Several small bug fixes and memory leak fixes are included. * Normalization now works correctly on files with corrupt packets. 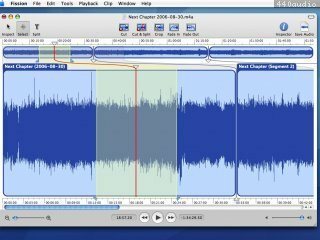 Fission est l'outil idéal pour découper un long fichier audio en plusieurs morceaux, ex: l'enregistrement d'un concert, conference ou d'une repete. Ça va vite. On enleve le surplus, on fade in/out, on crée les plages, on tag les morceaux et on exporte. En 5 mn, c'est pret! Par contre, ce n'est pas un logiciel pour les musiciens je trouve, préférez Amadeus Pro ou autre, pour la bidouille, création de loops, effets VST/AU, fusion de piste etc. J'ai acheté hier la version 1.1.1... Effectivement c'est un logiciel très intéressant pour segmenter en plusieurs morceaux un gros fichier. Le gros hic c'est qu'il est en anglais. Merci de me dire où trouver tuto ou manuel en français ? Audio recorder. Piezo makes it a snap to record audio on your Mac. In seconds, you\'ll be recording audio from any application or from audio inputs like microphones.